TUCSON, Ariz. — Florida St. (39-7) has been ranked No. 1 in the latest Collegiate Baseball newspaper NCAA Division I baseball poll. The Seminoles have won 10 in a row and secured their eighth Atlantic Coast Conference series victory of the season by defeating Maryland twice over the past weekend. 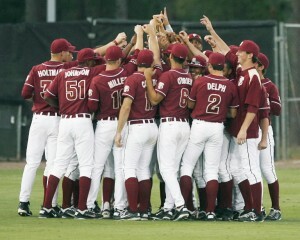 FSU’s magic number to clinch the top seed in the upcoming ACC Tournament and win the ACC Atlantic Division is two. Baylor had the same amount of points as last week with 499, but Florida St. edged the Bears out by one point. Baylor (38-8), ranked No. 1 the last two weeks, slipped to second after being idle last week. The Bears have won 27 of their last 28 games and are 18-0 in the Big 12 Conference. Poll Notes: In contests involving top 30 teams, Florida beat Kentucky two of three, South Carolina knocked off Arkansas two of three, Oregon beat Arizona two of three, Oregon St. beat Stanford two of three, UCLA defeated Purdue two of three and Oklahoma St. knocked off Oklahoma two of three. Several teams have put together impressive winning streaks. Utah Valley (35-11), ranked in the top 30 for the first time in history, has won a nation-leading 28 straight as it leads the Great West Conference with a 20-0 record. N.C. State has won nine straight, Virginia seven in a row and North Carolina five consecutive. Two teams fell out of the top 30 in Sam Houston St. (1-3 last week) and Oklahoma (2-3). New to the poll is Utah Valley and Oregon St.